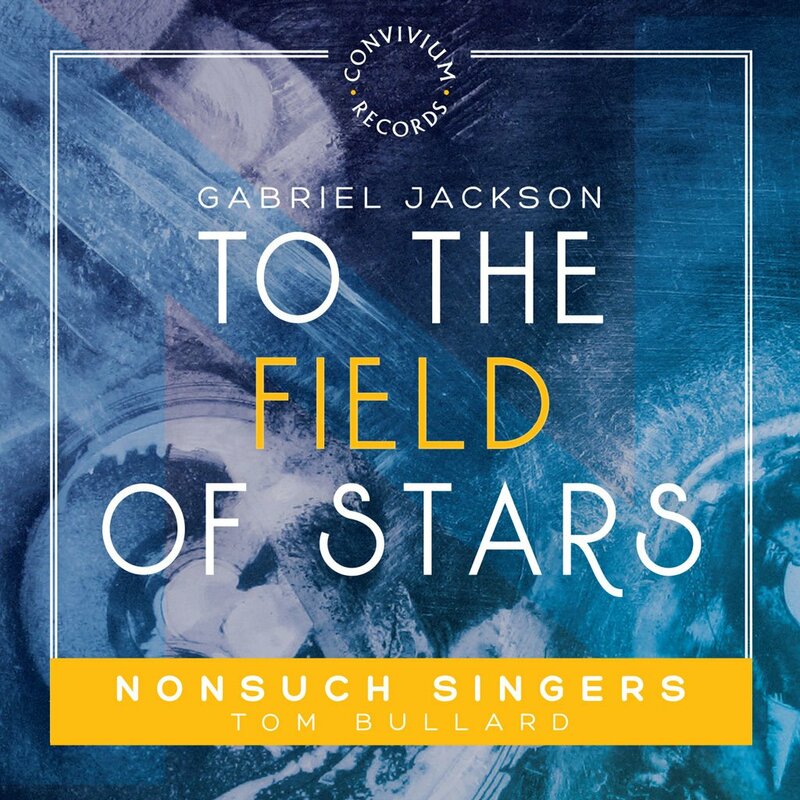 In October 2013, Nonsuch Singers gave the UK premiere of Gabriel Jackson’s To the field of stars, and it seemed the ideal piece for the choir’s debut recording. The companion pieces have their thematic origins in the stars and the heavens—Arvo Pärt’s invocation to the Morning Star, taken from his Seven Magnificat Antiphons, Jonathan Dove’s exultant Seek Him that maketh the seven stars, and another gem by Gabriel Jackson, Creator of the stars of night. Broadening the celestial theme allows for the inclusion of the Assumption of the Virgin in Victoria’s sublime Vidi speciosam, and the sheer joy of Byrd’s dance-like Laudibus in sanctis. Since the very first journeys to Santiago de Compostela began over 1,000 years ago, the Way of St James has been articulated and celebrated in music. The vast Codex Calixtinus, dating from the 12th century, is a compendium of advice and instructions for pilgrims, sermons, reports of miracles, prayers and polyphonic motets. Over the years many concert programmes have been devised to relive the mediæval pilgrims’ journey in song, drawn from the codex and other sources, and new pieces have been composed which also reimagine the experience of travelling the Way of St James. One of the first things that struck me was the possible etymological origin of ‘Compostela’ as ‘campus stellae’— the field of stars. This suggested a literal field of stars, and that notion became the sixth movement of the piece, a sustained, glistening carpet of murmured stars’ names underpinning a flickering high cello descant. In order to articulate and give structure to the journey, the piece is divided into seven movements, seven “stations” as it were, points of meditation and reflection which are separated by choral refrains and brief cello envoix. The texts of the refrains are drawn from a mediæval pilgrims’ hymn in the Codex Calixtinus and they also act as a Latin grammar primer, each verse addressing St James in one of the six grammatical cases (nominative, genitive, vocative etc.). These bare and rustic-sounding refrains are isorhythmic—the rhythm remains identical each time, only the pitches changing. The piece begins with an ecstatic and ululatory Intrada, a brief choral fanfare which apostrophises St James and his illustrious martyrdom. The seven movements that follow are both stages in the physical journey and reflections on the transforming experience of any arduous voyage, often sparked by key words in the preceding refrain in a kind of free association. Prayer for travelling is by turns optimistic and apprehensive, full of both fear and excitement about the journey ahead. A quiet chorale is repeatedly answered by melismatic exclamations from upper voices and cello replete with sighing appoggiaturas and declamatory glissandi. In the second movement, Pilgrims’ song with history lesson, the female voices sing of the joys of travel in rather obsessively jubilant tones. At this stage of the journey there is much to look forward to, and the almost-nonsense verse of their effusions is anchored by a jaunty march from the cello. Later in the movement we hear an account of the history of the shrine from the second president of the USA, John Adams. Walking with God is dominated, in contrast, by the male voices, a dark-hued riposte to the bright cheerfulness of the preceding movement. Cowper’s poem, so familiar as a comfortable Anglican hymn, is here reimagined as a raw and angry dark night of the soul. Beset by doubt and uncertainty, the pilgrims sing in ornate and anguished tones, thoughts of the dove of peace offering a brief moment of balm, and leading to a quiet and unsure conclusion. St James was noted for his performance of miracles, and in the fourth movement Walt Whitman tells of his apprehension of the divine in the everyday in a poem that is truly sacred in the broadest sense. Linguistically rich and full of ritualistic repetition, Whitman’s vision is set to some of the lushest music in the piece, its polyphonic intertwinings both meditative and sensual. In Emily Dickinson’s Our journey had advanced the end destination is almost certainly death (as was her wont) but that “God at every gate” may equally be found at the shrine of St James. The movement is simple and quiet, for the most part, its bare homophony briefly overlaid with filigree in the second verse. In a kind of other-wordly interlude, the whispered Field of Stars that is the sixth movement supports a solo soprano cantilena that also longs for those “heavenly citadels among the stars”. And then, at last, we reach our destination— the Basilica of St James —and “O how glorious is the kingdom” indeed! 2011, the year in which the piece was written, was the 400th anniversary of the death of the great Spanish composer Tomás Luis de Victoria and here his iconic four-part motet is elaborated by a further four polyphonic voices, its long concluding pedal- point launching the final peroration, an exuberant and jubilant hymn to St James. Bedecked by virtuosic cello roulades and chiming bell sounds, the piece ends, exhausted but uplifted, in a clanging pæan of fortissimo ecstasy. High-quality singing, innovative programmes and communicative performances are the hallmarks of Nonsuch Singers. The choir has gained a reputation for stylistic versatility in a cappella and accompanied works ranging from the Renaissance to the present day. It has frequently sought to make less familiar music accessible by exploring connections between works by established composers and lesser- known contemporary works. Concerts have featured a great many works by living British composers. 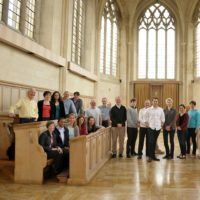 The choir of some 40 members typically gives six or seven concerts a year, regularly performing with some of the UK’s leading instrumental ensembles and nest young vocal soloists. Founded in 1977, Nonsuch Singers owes its name to the location of its first—informal —rehearsal which was held on the site of Nonsuch Palace. Tom Bullard, appointed in January 2013. Highlights have included Monteverdi’s Vespers with His Majestys Sagbutts and Cornetts at St Martin-in-the-Fields (recommended as ‘Critic’s Choice’ in e Times); a critically acclaimed concert of French Baroque works, edited by Lionel Sawkins, with an orchestra led by Catherine Mackintosh and soloists including Andrew Kennedy and Emma Kirkby; and the rst complete modern performance of Joseph- Nicolas-Pancrace Royer’s opera, Zaïde, Reine de Grenade, celebrating the 300th anniversary of the composer’s birth. Nonsuch Singers has given a number of world premieres, including John Tavener’s Exhortation and Kohima in the Royal British Legion Festival of Remembrance at the Royal Albert Hall (televised) and Wild Ways, Roxanna Panufnik’s setting of Zen poems for double choir and shakuhachi (a Japanese flute). 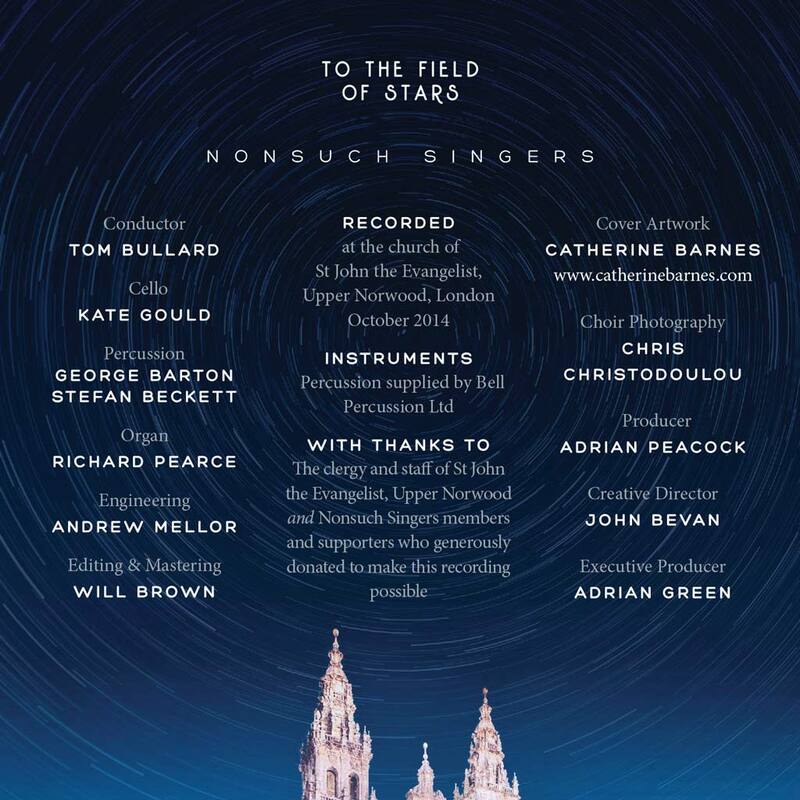 In October 2013 the choir was privileged to give the first UK performance of To the Field of Stars by Gabriel Jackson. Tom Bullard trained as a baritone at King’s College, Cambridge, and studies with Russell Smythe. His solo concert experience includes Bach’s St John Passion in Peterborough Cathedral, Vaughan Williams’ Five Mystical Songs in King’s College, and Fantasia on Christmas Carols in the Bermuda Festival, Mozart’s Missa Brevis in D at the Mostly Mozart Festival in the Lincoln Centre, New York, and the Requiems of Faure and Durufle. Tom was a Britten-Pears Young Artist in 2010, studying with Ian Partridge and Ann Murray. Recital engagements have included private functions at Dartmouth House, The Ritz and 10 Downing Street, an Opera Gala with Ann Murray for Opera South, and a programme of Haydn songs, duets and trios for Le Concert d’Astree in Lille, as well as a programme of Restoration songs with The City Waites for a BBC4 documentary. Tom was selected to compete in the Kohn Foundation Wigmore Hall International Song Competition 2011. On stage, his roles include Marcello in La Boheme and Jack Rance in La Fanciulla del West for OperaUpClose, Max in Demon Lover for the Grimeborn Festival, Dandini in Rossini’s La Cenerentola and Figaro in The Barber of Seville, both for OperaUpClose, Peter Ivanov in Lortzing’s Zar und Zimmermann for Opera South, the Soldier in Tom Wiggall’s opera, Alban, for Alban Opera, Smirnov in The Bear for Minotaur Music Theatre, Piquillo in La Perichole for Opera South, Macheath in The Beggar’s Opera, Adonis in Venus and Adonis and leading roles in HMS Pinafore, Ruddigore and The Sorceror. He is also an accomplished Musical Theatre performer, with appearances including Sky Masterson in Guys and Dolls, Anthony Hope in Sweeney Todd, Doody in Grease, and Lancelot du Lac in Camelot. From 2001 to 2008, Tom was a member of the Swingle Singers, and was Musical Director from 2004. Under his direction the group toured through Europe, USA, Asia, South America and New Zealand, performing in venues such as the Theatre du Chatelet in Paris, the Terme di Caracalla in Rome, the Philharmonic Hall in St Petersburg and the Royal Albert Hall. He spearheaded the group’s work with some of the world’s finest orchestras and conductors, including collaborations with Maggio Musicale, Florence, and the Vienna Philharmonic, both conducted by Zubin Mehta, the Orquesta Nacional de Espana under Josep Pons, and the Royal Liverpool Philharmonic Orchestra under Carl Davis. He worked very closely with Antonio Pappano, preparing performances of Berio Sinfonia with the Accademia di Santa Cecilia for the BBC Proms 2007 and the opening of the orchestra’s 07-08 season in Rome, and he coached the group through the world premiere of Azio Corghi’s opera PIA at the Teatro dell’Opera in Rome. His own arrangements have been recorded on a number of the group’s albums, published under the group’s own label, and have proved popular with choirs and ensembles worldwide, leading to a Contemporary A Cappella Recording Award (Best Jazz Song – The Lady is a Tramp). Tom is currently Musical Director of Nonsuch Singers, and recent performances have included Rachmaninov All-Night Vigil and Monteverdi Vespers, as well as the UK premiere and a CD recording of Gabriel Jackson To the Field of Stars. Tom is Head of Singing at Eltham College, where he directs the Eltham College Boys Choir, and also teaches Singing at Westminster Under School, from which some of his pupils have gone on to sing Miles in The Turn of the Screw for ENO in Vienna, Gustav in Love Never Dies at the Adelphi Theatre, and the Young Shepherd in Tannhauser for the Royal Opera. 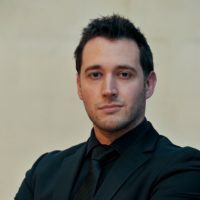 He also works as a vocal coach for the National Youth Music Theatre, and recently conducted the National Youth Choir and The Real Group in a sell-out concert at the Queen Elizabeth Hall. Recent solo projects include the Baritone solo in the world premiere of James MacMillan’s Since it was the day of Preparation at the Edinburgh International Festival (recently released by Dephian Records), the Baritone solo in Steve Reich’s multimedia oratorio The Cave in Strasbourg and Dresden, and solo performances with The City Waites for a BBC4 documentary on the painter William Dobson. He made his debut with the LSO in Richard Einhorn’s Voices of Light at the Barbican, and also his debut with Oper Frankfurt with The Cave in December 2016.